All the work and effort of gardening is worth it when you have a pair of beautiful tomatoes ripening on your vine like this pair. 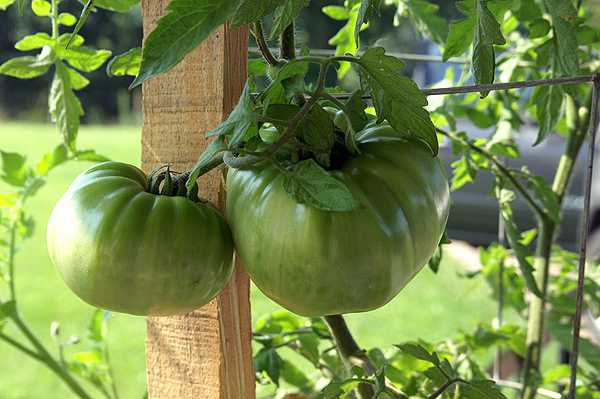 These tomatoes are an old heirloom strain, which will reproduce true from dried seeds. A prize not only for this year, but for years to come. This entry was posted on Tuesday, July 10th, 2012 at 4:04 pm. It is filed under Agriculture, New Images and tagged with fruit, green, heirloom, ripening, tomatoes, vine. You can follow any responses to this entry through the RSS 2.0 feed.